Comparable to the Cold Steel FGX knife series. 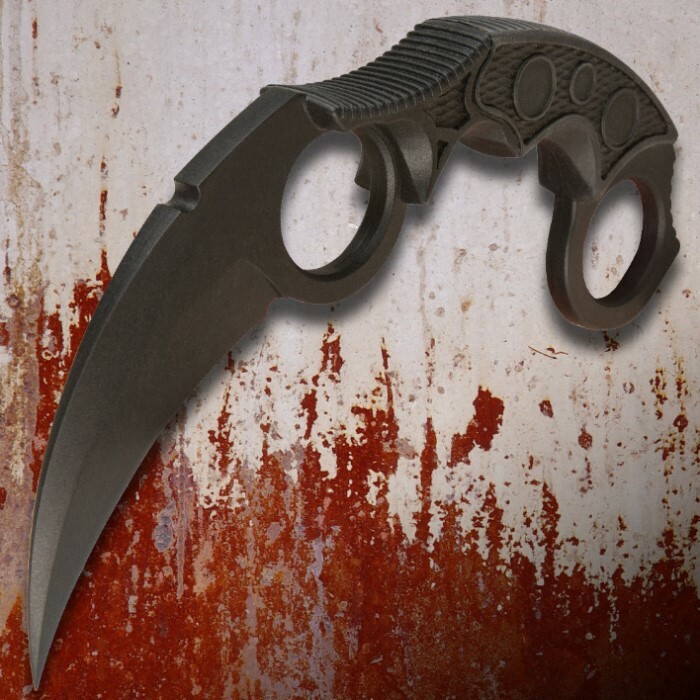 When you need an easily concealed defense weapon, our Non-metallic Karambit is the perfect fit. This hard plastic dagger offers generous size finger holes for an excellent grip whether the blade is held down from the fist or extending from the top of the hand. Includes a black nylon sheath. Plastic? Check. Sharp? Nope. But that does not matter. The point is, well, pointy, and can extract an artery or eye and could cut. The sheath is worth the price alone! Great to hide in multiple places without fear of rusting or corrosion. Fits nicely in my hand and has a very sharp point. I bought several of these on a BOGO deal. While it is not made of metal(therfore undetectable with a metal scanner) it is some very sturdy plastic. I believe this item could hook a jugular and rip it out with no problem, or be used to stab/jab an assailant. It is perfect for a woman to carry in a purse. The point is very sharp and I am sure capable of penetration. The blade part is a toss up, but since it is polymer I would not expect it to be sharp. I don't know if the snaps on the sheath would trigger an alarm in a metal detector or not. It would be nice to know if someone tries it whether it triggers the alarm. I got this from my friend Sabastian, great trainer, some edge, and has a sharp point. We use it in airsoft with our friends (I'm an assassin. Childish I know XD) But it is a very good "knife" if you will, deserves four stars. This thing is cool. It is a great onetime use and loose tool, and cut the button out and replace with hook and loop ( Velcro ) you can get it into almost anywhere.